A while later, he performed the unofficial anthem of his native city – Leningrad (now St. Petersburg). The Russian leader showed off his virtuosity during the international ‘One Belt, One Road’ forum in Beijing. The event has brought together numerous heads of state and government, along with their top aids and the representatives of global financial organizations. As one of the forum’s keynote speakers, Putin called for the construction of transport corridors and the creation of large-scale energy projects. The “civilization project for the future,” as Putin called the New Silk Road, should bring stability and prosperity along its way. 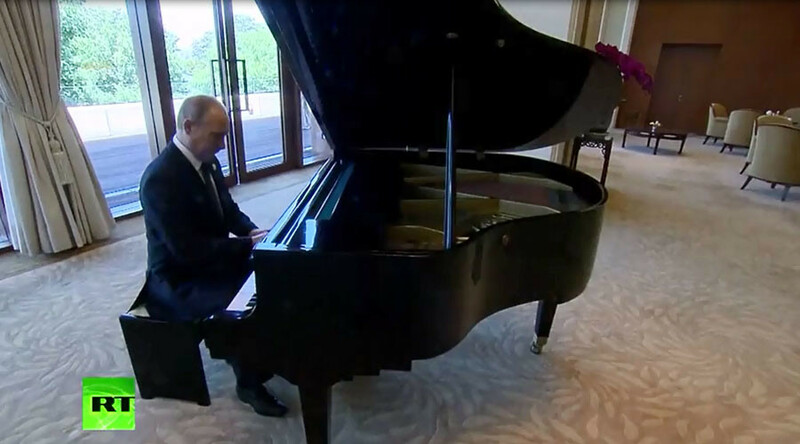 This is not the first time Russia’s president has surprised audiences with his musical skills. In January of this year during a meeting with students at Moscow State University, he sang along to the tune of a Soviet song ‘14 Minutes till Launch’, which celebrates the USSR’s achievements in space. In 2010, while serving as prime minister, Putin famously took to the stage at a charity event where he sat at a piano and played the beginning of Blueberry Hill before an audience packed with international celebrities, including Kevin Costner, Mickey Rourke, and Sharon Stone. A while later, he even sang the song in English.